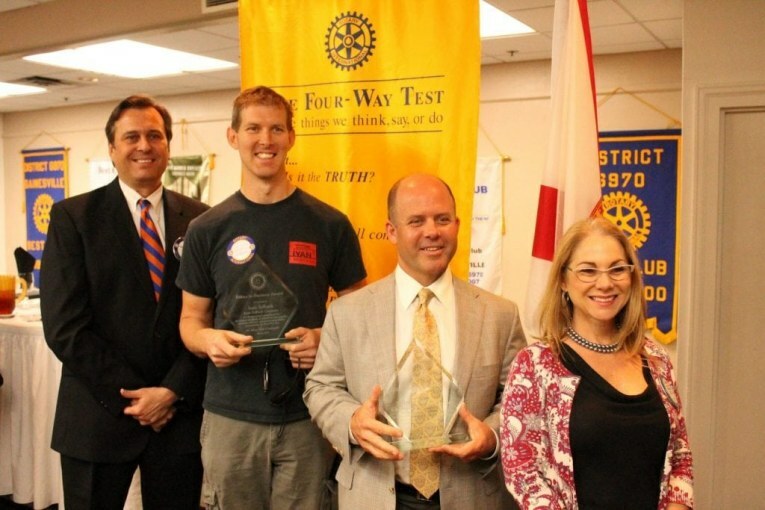 Two local business people have won the 2013 Ethics in Business Awards, presented annually by the Rotary Club of Gainesville. Rory Causseaux, CEO of Causseaux, Hewett and Walpole, Inc. and and Ivan Solbach of Ivan Solbach Co., Inc were recognized at a special luncheon ceremony earlier today. The Ethics in Business Awards, which were established three years ago, recognize local business people for their contributions to business excellence and the highest standards of ethical conduct. Nominations for the awards were solicited from the community. Teams of students from the Poe Center for Business Ethics Education and Research at UF’s Warrington College of Business Administration then conducted interviews with each nominee and presented their findings to a committee of Rotarians, which made the final selections. The judging criteria are based on the Rotary Club’s Four Way Test, which emphasizes honesty, fairness, goodwill and benefits for all. Causseaux is CEO of Causseaux, Hewett and Walpole, Inc, which he founded back in 1988. The company averages 8000 to 1000 projects annually and employees more than 50 professionals and administrative staff members. According to Causseaux, the firm bases its Vision/Mission statement on its core values of Integrity, Dedication, Excellence, Responsibility, and Stewardship. Causseaux has participated in a number of activities to raise funds for local charities, including climbing Mt. Killimanjaro to raise funds for the Climb for Cancer foundation. His firm has supported many charities, including Bread of the Mighty Food Bank, Toys for Tots and Friends of the Children. Causseaux has been active in the Rotary Club of Gainesville Sunrise and the Rotary Foundation, helping raise money for both local and international projects. He’s a leader in his church, Westside Baptist. He’s also supported economic growth in the community by serving on the boards of various businesses and professional organizations, including Gateway Bank, the North Central Florida Builders Association and Gainesville Area Chamber of Commerce. Ivan Solbach and his wife Jennifer started Ivan Solbach Co., which specializes in residential construction, in 2004. The firm is recognized for its commitment to energy efficiency and environmental awareness, and has championed the use of renewable energy, including solar. It also prioritizes excellent value and great customer service. Solbach and his wife are active supporters of the March of Dimes and other child-focused organizations, including the Shands Neonatal Intensive Care Unit (NICU), which cared for their son when he was born four years ago.